The paranoid, skeptical, post-Watergate America gave birth to Sydney Pollack’s first-class thrilller Three Days of the Condor. The film, carried out on the shoulders of glorious Robert Redford and Faye Dunaway and orchestrated masterfully by Pollack, is based on James Grady’s novel Six Days of the Condor, adapted by screenwriters Lorenzo Semple, Jr., the writer of The Parallax View, and David Rayfiel, a frequent collaborator of Pollack’s. In a nail-biting way, the film delves into the moral ambiguity that characterized the early 1970s US government and deftly reflects the prevailing feelings of distrust and betrayal in the American society. We urge you to take a careful look at Semple Jr. and Rayfiel’s screenplay, one of the more prominent examples of fine spy thriller writing. Also, don’t make the mistake of ignoring Lorenzo Semple, Jr.’s 2008 two-and-a-half hour interview, in which he discusses the high points of his career in feature films (Papillion, The Parallax View, Three Days of the Condor), or Hollywood’s great interview with Pollack two years before his death in 2008. A monumentally important screenplay. 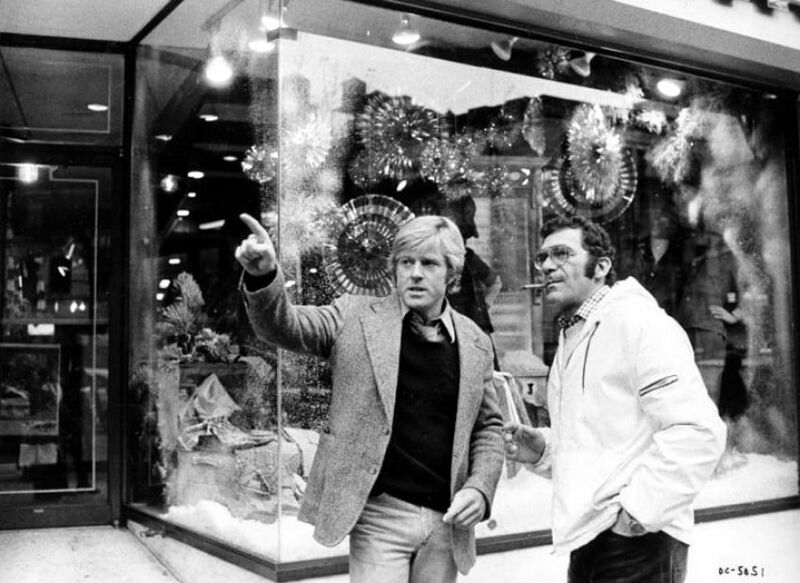 Dear every screenwriter, read Lorenzo Semple, Jr. & David Rayfiel’s screenplay for Three Days of the Condor [PDF]. (NOTE: For educational and research purposes only). The DVD/Blu-ray of the film is available at Amazon and other online retailers. Absolutely our highest recommendation. Sydney Pollack interviewed by Patrick McGilligan. Sydney Pollack: Hollywood’s Quiet Icon. Let’s talk about Three Days of the Condor. That’s another film that’s gained stature over the years, although when it came out, several of the New York critics took it very seriously. It was kind of a prescient movie because we thought we were really going out on a limb talking about destabilizing foreign regimes in the interest of oil and the CIA killing people and then all of the sudden, all this crap comes out, while we were shooting the movie! All the stuff about dirty tricks with Nixon. We cooked all that stuff up that’s in the movie in a hotel room one night, and we’re thinking ‘Man, maybe this is just too far out. Is anybody really going to buy this?’ (laughs) But that part of it worked. There are definite Hitchcock elements in Condor. Was he a big influence for you? That doesn’t mean that I don’t love them, because I do. Once I get in there and get transported, it’s great. But I feel like it’s work. It’s my job. And I don’t want to be doing it when I have free time, you know? If I have the evening off, the last thing I want to do is go to a screening. I do have a screening room at home, like all spoiled brats in Hollywood, and I have screenings at home a lot. I’m terrifically impressed with a lot of the new younger directors like David Fincher, and I enjoy producing a lot of them. So Hitchcock wasn’t a big influence on me simply because I didn’t know his work. Had I known his work, he absolutely would have been. I actually spent more time at Hitchcock’s house with him personally than I did seeing his films. Robert Redford in Three Days of the Condor. How was that?